There are a few men who can rightly be called jazz composers, and, perhaps not surprisingly, four of the most important of them have been pianists: Jelly Roll Morton, Duke Ellington, Thelonious Monk, and John Lewis. To take this right down to the present, what amounts to a new school of jazz composition is to be found in the person of Horace Silver. The conjunction of Silver and the Jazz Messengers, and the music Silver has written for that and subsequent groups, is probably the single greatest impetus to the "funky" school. 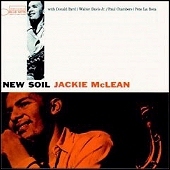 And here, on this album, is a young man, another pianist, composing in the same tradition--Walter Davis Jr. On his first Blue Note album, Jackie McLean's New Soil he contributed three tunes, notably the bouncing, humorous "Greasy." On this, his first album as a leader, he contributed all the music. 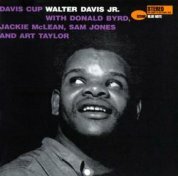 There is a difference between composition and the mere sketching out of riffs, and Walter Davis Jr. has gone a long way toward achieving this distinction. One of the things that Walter Davis Jr. has kept in mind on this album is one of the best lessons of the great Duke Ellington, a lesson so simple it is often overlooked--write for the men who are going to play your music. As I mentioned, Davis is in the Silver tradition. 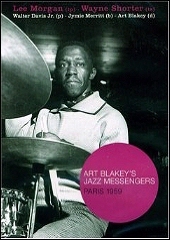 At present, he is pianist with Art Blakey and he has chosen as soloists two men associated, at various times, with these musicians--Donald Byrd and Jackie McLean. These two constitute an ensemble in themselves--they have worked together, on and off, for several years, in clubs and on records, and know each other's minds as closely as is possible for musicians that do. On the New Soil album, they proved to be excellent interpreters of Walter Davis' music, and I think you will find that he was wise to choose them this time. Both men continually improve with every record, in the direction of a greater sureness of approach. 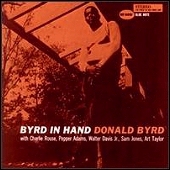 Byrd, it seems, grows more lyrical with time. And McLean, in particular, seems bent on exploring the individual possibilities of each tune he plays, rather than simply "running the changes." Notice, for instance, on "Rhumba Nhumba," how he takes the tune's offhand reference to "Hawaiian War Chant," alters it to become his own expression, and plays with it for all it is worth. Sam Jones and Art Taylor, on bass and drums, are veterans of several Blue Note sessions, and provide here their usual sympathetic support. And then, of course, there is Walter Davis Jr.'s piano playing. On "Sweetness," to take just one example, he performs a feat that is, unfortunately, much too rare these days. He performs a ballad without resorting to the device of double-timing, and at the same time avoids making it sound like a funeral procession. And if this were not difficult enough, he has the restraint to let his song stand for itself on the first chorus. He likes it, with justice, and plays it without embelishments. When I asked Walter the by now standard question, who was his favorite piano player, he had the answer very decisively before I had even finished asking. "Tatum," he said. "Tatum. Tatum. Tatum. And then Bud Powell." As for the men on this date, Walter could not be happier. "Jackie is the most spontaneous alto player around," he says. "And Donald--he can really interpret your music." In many ways, as a matter of fact, this album got its start well over a year ago, when Donald Byrd and Art Taylor took a group to Europe, with Walter on piano, when many of his tunes were used. Walter Davis Jr. is still a young man, and has a long way to go, a way that has a very impressive beginning to it. Perhaps, in time, he will join the inner circle of true jazz composers, the ones who have enriched us with works of the stature of "'Round Midnight" and "The Preacher."